I have been assessing and indexing my blog lately and I realised I had not posted anything for the first six months of this year; and so I looked at my work record and found I was just a little bit busy with organising events at the library. We stood at the back of the hall clutching our tickets for Row X dismayed that the rows stopped at Row V. There was no Row X. The group of us grew in numbers as we hailed the attention of an usher. Traipsing back out to the foyer we were reallocated tickets to the Balcony in Row OO. This was our experience when we purchased tickets online for the Elvis Tribute Show with Jack Gatto at Melbourne Town Hall. As an information professional I know about the quick evaluation of reliable sources; and in my defense it was not me who found and selected the website. But I should have checked. So an expensive and annoying lesson learned. But the show was good and Jack Gatto gave a great show with a powerful voice very like Elvis. The choir, backing singers, and big band were led by John St Peeters. Jack did the outfits justice and enthusiastically busted the moves. Not quite the decade for us, but you can’t deny those classic songs. Earlier we had enjoyed beer and a meal at Il Pom Iltalian at Federation Square, while young football fans, dressed in blue and white and yellow and brown, played kick-to-kick under yellow fluoro lights in the ‘square’. After the show we walked back to our car parked in the gardens. The cold winter night air shimmering rainbow fog against the colourful lights of the Melbourne cityscape. Art, music, love, life and loss: a novel that weaves these themes together falls into a favourite genre for me. And obviously for many others, given that Heather Rose has won the Stella Prize for her 2017 novel The Museum of Modern Love. I love it when I discover something new that I had never heard about before, and I confess that I had never heard of the artist Marina Abramović before reading this novel that is inspired by her work. The Artist is Present was an amazingly popular artwork that Marina performed at MoMA in 2010. For seventy-five days Marina sat while individuals sat across from her one after another. 1,554 people sat while another 850,000 observed from the sidelines, many coming back. Here is a video clip from the last day of her sit. And here is another astounding video of when Ulay came back to see her after their epic parting on the Great Wall of China years before in 1988. The days had been fields of faces, bright, unique, vivid, strange. …Every face told countless lives and memories and part of humanity she had never glimpsed, not through all the years of seeking. But it is the intertwining story of Arky Levin that gives this work of fiction life and opportunity for exquisite prose. His hands ran up and down the keyboard…He heard the theme that would run in and out of the film, threading the scenes together. Raindrops falling on leaves, a moon in the sky and this lovely melody. He is a sad, reserved, composer of film scores: a private man who is reluctantly drawn into this temporary and unusual life that surrounds Marina Abramović as she sits and gazes into the eyes of strangers at MoMA. Rarely do I give a 5-star rating on GoodReads. Thank you Heather Rose. It has been a busy week for me as I have organised the local events to celebrate National Library Week. We kicked off the week with the Sydney Writers Festival. This year’s Sydney Writers Festival was live-streamed across the country, and it was my job to liaise with the organisers to have it broadcast at Frankston Library. The quality of the live stream was excellent and it really felt as though you had front row seats in Sydney. Andrea Louise Thomas was the MC for our local event and she had prepared questions for audience discussion after each talk. The ‘live and local’ sessions continued on the Saturday and Sunday, at the library, and these were very much appreciated by those that attended. National Simultaneous Storytime was celebrated with much hat wearing fun by lots of children who took part at our libraries. We also offered video versions on our Facebook page. The current Miles Franklin Award winning author Sofie Laguna spoke eloquently to an eager crowd mid-week; The Eye of the Sheep a source of much discussion. A local pianist Yani played our old possum-painted plunka during two lunchtime periods. She competed bravely against dodgy piano keys, seagulls, crows, traffic noise, wind and rain. I sat contentedly listening to her imperfect renditions of Beethoven, Schubert, Chopin and others. We conclude our busy week with a live music concert with Sympatico. A competition is yet to be concluded. We posed the question: ‘When was the first free library provided in Frankston?’ The answer is on display in our libraries. The wind howled in from the sea angling the rain across the grey landscape. Undeterred by the rattling old theatre the young musicians played on absorbed in their efforts to revive the talented masters of old. 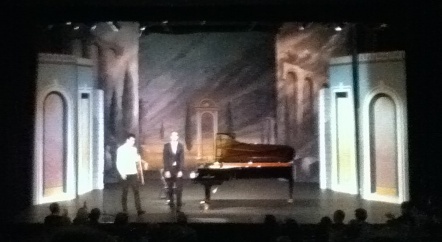 Kristian Winther on violin and Anthony Romaniukon piano gave an inspired live performance – In Search of Lost Time– at the Reardon Theatre as part of the annual Port Fairy Spring Music Festival. Reliving the Flaneurs of Belle Epoque Paris, they wove an intricate musical tapestry: Poeme by Chausson; Rhapsodie d’Auvergne by Saint-Saens; Carmen Fantasy by Sarasate; and Sonata by Ravel. The melancholy flavour of the selection was perfect for such a day and a real treat for those of us huddled in the dark warm shelter of the theatre on a wild spring Sunday in wild south –west Victoria. You can see some of Kristian Winther’s work here. You can see some of Anthony Romaniuk’s work here. Here are some other versions of these pieces that I have located online: Poeme played by Stephen Waarts; Rhapsodie d’Auvergne played by Emily Pei’En Fan; Carmen Fantasy played by Sarah Chang; Ravel’s Sonata(this is really beautiful and well worth listening to). Under a moonlit sky, with Hanging Rock illuminated in the background, Leonard Cohen held the thousands spellbound as he recited A thousand kisses deep. It was a magical performance. He and his support band are a class act, with undoubtedly world-class talent. The obvious gap between their musical ability and those of the support acts of Paul Kelly and crew, Clare Bowditch, and Dan Sultan perhaps accounted for their apparent stilted performances. I expected much more from these great Australian talents, but their contributions were brief and lacking in enthusiasm. Leonard Cohen more than made up the shortfall, but I wonder at Paul Kelly. He is a seasoned performer and haled in this country as one of our greats. Was the mastery of Leonard Cohen and ensemble just so superior that it even made the likes of Paul Kelly feel inferior? The day was perfect with no rain and the first warm day of the summer season. So it was hot standing in the queues waiting to get in and then as the day grew long the sun took its toll. You definitely needed a hat and the Leonard Cohen style was dominant. The break between Paul Kelly and Leonard Cohen hailed the opening of the gourmet picnic hampers and we were surrounded with tempting Master Chef creations. We had not been organised and so joined the queues again to buy hot samosa’s and ice creams. Crowd behaviour is amusing to watch, don’t you think? There is a self-organising aspect but it only goes so far before chaos takes over. Maybe it can be defined using the Chaos Theory? So the guidelines stated that you were allowed to bring in a camp/deck chair, food, only sealed bottles of water, no glass, no umbrellas, no alcohol but it would be for sale in the venue, and no SLR cameras. And these rules were made to be broken it seemed, or perhaps many just didn’t read the guidelines on the website. So of course there were SLR cameras about, and glass brought in, and I saw an umbrella. So people choose and stake their spot on the grassy hill and then place their chairs, rugs, eskies, etc. Then as the crowd grows and more people come in, what was a somewhat organised pattern of rows now gets crowded in as other people squeeze in between the generous territories already staked. Then there is the problem with the chairs. Seasoned Port Fairy Folk Festival people will try to exert their traditional PFFF rules relating to low chairs (folkie chairs) and the higher camp chairs. They will shoo anyone away who dares try to set up their higher chair in front of them. And will also try to wave people to sit from 3 or 4 rows back so that they get an uninterrupted view of the tiny ant-size humans on the stage far down at the bottom of the paddock. Thank goodness for big screen technology. At full capacity the crowd had no sensible traffic flow in and out of any “spot”, or any way to identify this spot when returning from buying food or alcohol or a lengthy trip to the toilet queues. The coffee queues were just plain silly. It became amusing entertainment seeing people navigating the crowded mishmash of the audience, and not being able to find their way back. They would stand with the sun in their eyes lost and forlorn, often holding bottles of wine and beer, talking on their phone to their mates in some attempt to find their spot. You couldn’t even identify groups by their hats because most were like Leonard Cohen’s hat. Leonard Cohen made it all worthwhile. He was generous with his time and attitude and gave us everything. His backing singers, the Webb sisters, have voices like angels and contrast perfectly with his ruff croon. His guitarist, Javier Mas, is a master in his own right and one guitar solo in particular provided another spellbinding performance. It is a fine lesson in how to tame a fidgety uncomfortable bunch of people and quieten and hold them still and focussed for a few precious minutes. By the end of the night I was shivering and waiting for Leonard to finish so I could go home. We made a dash for it and crowded into Phil’s blue Landrover that stood out in the car-park amid the more popular styles of car. It was a special and unique experience that I am glad I had despite my dislike of crowds of people.